Whether you’re jetting off for a two-day venture or a weeks-long vacation, the necessities you’ll need to pack with you to make that trip enjoyable are hardly different. This is especially true when it comes to what to pack in your carry-on, the bag you won’t send off to sit in the belly of the plane—the one you’ll have with you throughout your entire trip – those essential carry on items to pack. So what should you pack in it—aside from your wallet, some chewing gum and a book or magazine to keep you entertained? Here’s your quick-guide to carry-on essentials. The Transportation Security Administration (TSA) won’t let you bring a plastic water bottle through security—or a reusable one that’s filled with liquid—but they will let you bring an empty one. Pack yours to avoid having to buy one before hopping on your flight—or having to wait for the stewardess to start making her beverage rounds. Don’t rely on airplane food to fill you. Even if you’re confident that you signed up for an on-board meal, you might be unhappy with what you get. In addition, many domestic flights these days no longer offer even a snack—complimentary or not. Before you hop on the plane, stop by a quick mart in the airport for some easy-to-eat (and pack) fuel. Snacks are an easy to pack essential carry on item – don’t forget them! Especially if you’re traveling for business, your computer’s battery life needs to be top of mind – even while you’re in transit – making different length computer cables essential carry on items. To make your life that much easier when you’re logging on on-the-go, whether that’s waiting for your flight to board or waiting for your transportation from the airport to arrive. Because you don’t know what the layout of the airport will look like, or which seats will be available near an outlet, make sure to carry both a long and short charging cord. This will seriously come in handy when that outlet location is less than ideal. Word to the wise traveler: Don’t stash your passport in just any pocket of your carry on. Instead, pack a small wallet-size bag that you can store inside your travel bag that contains all of the really important items you need for travel purposes: your ID, wallet, ticket, medications. And, whatever you do, don’t pack medications that you really need in your checked bag. If anything gets lost, you’ll have a headache trying to phone your doctor to prescribe you another dose to a pharmacy near where you’re traveling. Thousands of planes are delayed or canceled every single day for a number of different reasons. Of course, you hope yours isn’t one of them, but it’s better to be safe than sorry. In case you have to hangout at the airport longer than you planned or even stay at a hotel nearby to catch your rescheduled flight the next day, stash an extra pair of clothes in your carry-on bag. Think comfortability—sweatpants, a warm, long-sleeve top—since you might be sleeping in them overnight. Another thing you shouldn’t rely on your airline for: headphones. While many airlines do offer them complimentary or for purchase, bring your own pair just in case. 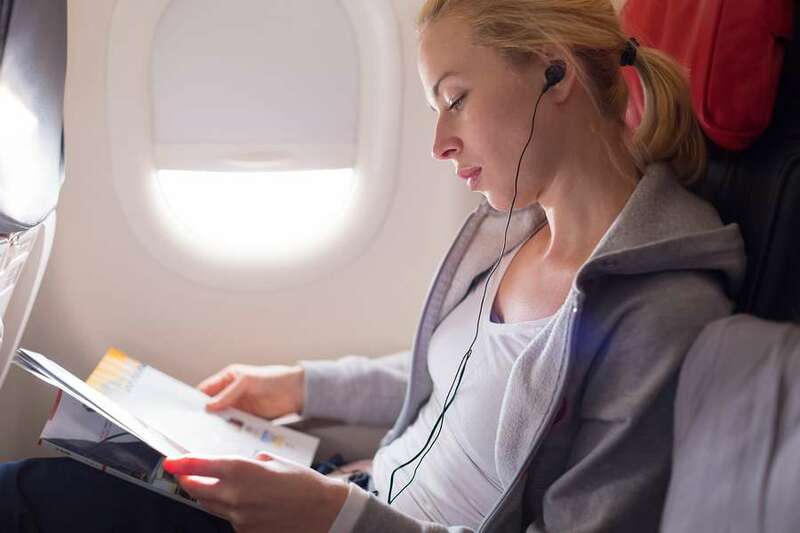 Whether it’s to listen to music, watch something on the mini TV in front of your seat or even just to cancel out the obnoxious sounds of other passengers, you’ll be glad you had a pair with you. Make sure a good pair of headphones are at the top of your essential carry on item packing list. These will also come in handy if you flight gets cancelled or even delayed, but even in the event that it’s right on time, you won’t regret having some basic essential toiletries with you. This can include anything from a travel toothbrush and toothpaste to face wipes and even eye drops. Remember that, in addition to not completely knowing how long you’ll be traveling for, you also don’t know the conditions in the plane. As many frequent travelers know, air in the plane’s cabin tends to be dry. This is due to the fact that the aircraft needs to pump in outside air to dilute the air inside the plane. This air coming from outside the plane is incredibly dry because it’s often hovering at around 30,000 feet. Pack some moisturizer for both your face and both to help combat dry skin. Jenn is a freelance writer, editor and content strategist in NYC. Her work can be found in Women’s Health, SELF, Health, Reader's Digest, and more. When she's not putting pen to paper (or fingers to keyboard), she can be found traveling the world and discovering more about the big apple of a city she's always dreamed of calling home.